EARLY DIAGNOSIS AND EARLY TREATMENT ARE KEY TO CONTROLLING DISEASE AND MAINTAINING TEETH FOR A LIFETIME. A good first line treatment for periodontal disease is a non-surgical therapy called scaling and root planing. This can be thought of as a thorough, deep cleaning which focuses on the areas where the periodontal bacteria is furthest under the gum tissue. This procedure begins with getting the areas that are most involved numb with a topical or local anesthetic. Next, an ultrasonic instrument is placed in the deep pockets between the tooth and the gum tissue. This helps to disrupt the biofilm, remove the bacteria and help vibrate off the hardened calculus (tartar) that is on the tooth and root surfaces. This is followed by the use of specially shaped hand instruments that are designed to help remove additional bacteria as well as aiding in the smoothing of the root surface. A smoother root surface should, in turn, be easier to keep clean on a daily basis and at routine cleaning appointments. Depending on the severity and extent of the disease, the scaling and root planing appointments may require one to four hours to be completed. This is typically completed in one to two appointments. There should be little discomfort after this procedure and should cause minimal disruption to daily life. If needed, standard over the counter pain relievers reduce the minimal pain that could be present. Six to eight weeks later, a complete periodontal re-evaluation is completed to determine the patient’s response to the scaling and root planing. At this appointment, Dr. Recker will perform a clinical evaluation similar to the initial consultation to determine whether areas of active disease remain. 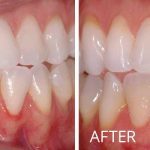 As the gum tissue has had time to heal itself and reattach to the previously diseased root surface, a decrease in swelling and bleeding is often found at this appointment. There is also typically a decrease in the depth of the periodontal pocketing around the teeth. If there is little active disease left, the patient will be placed on a periodontal maintenance (cleaning) regimen (discussed below). If areas of active disease remain, one of two routes of treatment will be taken. The most common next step is surgical therapy. This treatment allows better access to the difficult to reach areas of the mouth, most often including the molars. We typically see the molars as the teeth displaying the most periodontal bone loss in the mouth. When combining this fact with the tortuous anatomy on the roots of these teeth, it is no surprise these are also the least predictable teeth to treat using a non-surgical approach like scaling and root planing. The second, and less common, treatment involves beginning a three month periodontal maintenance (cleaning) regimen. If active disease remains after 2-3 of these appointments, despite good oral hygiene home care compliance, surgical therapy would then be indicated. Dr. Recker provides a variety of surgical services aimed at achieving periodontal health and stability in the mouth. These treatments are performed in a gentle manner and are limited to only the areas where surgical treatment is most necessary. Patients report being comfortable during surgery and most have very little discomfort following the procedure. Few, if any, non-narcotic pain relievers are necessary with these treatments. This procedure starts with sedation (oral or intravenous), if desired, followed by administration of a local anesthetic (Novocaine). The gum tissue is then gently separated back from the underlying tooth roots and bone. The root surfaces are then thoroughly cleansed of the disease causing bacteria, similar to when the scaling and root planing was completed. 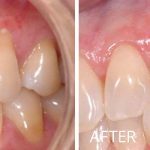 The advantage with the surgical treatment is that Dr. Recker can now see distinctly the disased root surfaces that need to be cleaned. Attention is then turned to evening out the irregular bone contours around the teeth, limiting the areas where infection-causing bacteria can hide. The gum tissue is then secured tightly in place with sutures that dissolve on their own. The patient is then sent home with thorough instructions on taking care of the surgical areas, dietary instructions for immediately post-surgery and medications which help keep them comfortable. Post-operative appointments are typically scheduled two weeks after the surgery, followed by a second post-operative appointment two to three weeks after the first. Occasionally, periodontal bone and gum destruction has occurred in such a way that regeneration of this lost bone and gum tissue is possible. This is typically seen when the periodontal bone destruction is particularly severe on one surface of a tooth. With periodontal regeneration, this lost bone and attachment can be regenerated, typically utilizing a bone graft material. The bone graft material is a donor material that helps provide the body with the scaffolding it needs to reverse the effects of periodontal bone loss. Once active periodontal therapy is completed, it is imperative that a patient begins a regular periodontal maintenance regimen. Research is clear that when a periodontal patient receives regular, three month periodontal cleanings, the periodontal disease is more stable than in those individuals that do not choose to maintain at this interval. We have found that, at least at first, these appointments are best completed with the patient alternating between Advanced Periodontics and Implants and their regular dentist. This allows Dr. Recker to continually monitor the periodontal disease, while at the same time freeing the dentist to look more thoroughly at restorative concerns. If the periodontal disease is found to be stable over time, we may consider stretching the periodontal maintenance interval to every four months instead of three. It is rare that the periodontal disease will remain stable in individuals that choose to have only two dental cleanings per year, with an increased amount of tooth loss seen in these individuals. Did you know that the health of your mouth could be affecting the health of the rest of your body? Are you aware that by treating diseases of the mouth, the overall health care costs for diabetics is lower? Have you heard that poor oral health can lead to a greater risk of developing heart disease? If you were unaware of any of this, please read on. Over the last several years, the medical and dental communities have been discovering that they are more closely related than once thought. The unifier appears to be chronic inflammation, which is the body’s response to an infection or irritant. It has now been shown by both communities that poor oral health (chronic inflammation) is linked with poor overall health of the body. People with diabetes are more likely to have periodontal disease than people without diabetes, probably because people with diabetes are more susceptible to contracting infections. In fact, periodontal disease is often considered a complication of diabetes. Those people who don’t have their diabetes under control are especially at risk. Research has suggested that the relationship between diabetes and periodontal disease goes both ways – periodontal disease may make it more difficult for people who have diabetes to control their blood sugar. Severe periodontal disease can increase blood sugar, contributing to increased periods of time when the body functions with a high blood sugar. This puts people with diabetes at increased risk for diabetic complications. Several studies have shown that periodontal disease is associated with heart disease. While a cause-and-effect relationship has not yet been proven, research has indicated that periodontal disease increases the risk of heart disease. Scientists believe that inflammation caused by periodontal disease may be responsible for the association. Periodontal disease can also exacerbate existing heart conditions. Patients at risk for infective endocarditis may require antibiotics prior to dental procedures. Your periodontist and cardiologist will be able to determine if your heart condition requires use of antibiotics prior to dental procedures. Research has found that men with a history of gum disease are 14 percent more likely to develop cancer than men with healthy gums. Researchers found that men with gum disease were 49% more likely to develop kidney cancer, 54% more likely to develop pancreatic cancer, and 30% more likely to develop blood cancers. Erectile Dysfunction: As the study published in the Journal of Sexual Medicine indicates, a man’s periodontal health could affect his sexual health, finding that men in their 30s who had severe periodontal disease were three times more likely to suffer from erection problems. Another study done by the American Urological Association found that prolonged chronic inflammation, like that found in men with periodontal disease, can cause damage to blood vessels which can lead to impotence. The premature loss of teeth, especially in individuals with complete lower dentures, or the presence of multiple loose, uncomfortable teeth have been shown to increase the prevalence of gastrointestinal disorders. Without the ability to properly chew food, food is swallowed in larger pieces. This leads to a decrease in the body’s ability to extract proper nutrients and also leads to an increase in gastrointestinal problems. According to a large study of individuals who are missing all lower teeth and using a complete lower denture, the rates of psychological disorders (e.g. depression) were found to be high. Once the dentures were securely fastened to the lower jaw, utilizing dental implants, the rates and severity of these psychological disorders were found to be lower. People were able to regain the confidence to eat comfortably and dine out in public without the fear of their teeth moving or coming out of the mouth. Do you have sensitivity in your mouth when you drink cold beverages? Do you notice the teeth in your mouth are appearing longer? 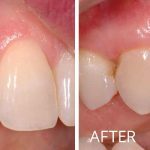 Are you concerned with dark spots along the gum line showing in your smile? If “Yes!”, then soft tissue (gum) grafting may be the procedure you need. Esthetics – the root surface of a tooth is darker than the enamel of the tooth. When gum tissue is lost on a tooth, this darker root surface becomes visible. Root exposure that is getting worse – when the amount of root exposure is getting worse, attachment that is holding the tooth in place is being lost. Over time, this can lead to a less stable tooth. Lack of thick, resilient gum tissue directly around a tooth – without the proper type of gum tissue around a tooth, the body is unable to protect itself as well from the trauma of bacteria, chewing foods and daily oral hygiene efforts. This can lead to progressive root exposure. If you are experiencing one of the four items listed above, a soft tissue grafting procedure can aid in improving this problem and can help you maintain your teeth, in a state of health, function and esthetics, for as long as possible. Depending on the clinical findings in your mouth, Dr. Recker may recommend one of two types of soft tissue grafting: Connective tissue grafting or Free gingival grafting. The need for the particular type of graft will be discussed with you in detail at your consultation appointment. With a gum grafting procedure, Dr. Recker begins with sedation (oral or intravenous), if desired, followed by administration of a local anesthetic (Novocaine). The exposed root surface is thoroughly cleaned, removing any bacteria and their toxins from the site. The gum tissue in the area is then prepared to receive the gum graft. The gum graft can be obtained either from the roof of the patient’s mouth or from a donor source. The choice of material depends on your presenting clinical situation, as well as your desires. Once this material is obtained, it is placed and secured at the treatment site, resulting in an immediate improvement. Although slight pain and swelling are not uncommon with this procedure, the use of prescribed medications, in conjunction with mild activity, will help to minimize these symptoms. In your mouth, there area several adhesions attaching your lips and cheeks to the gums around the teeth. This adhesion is called a frenum and is often most prominent in the midline of the upper and lower teeth. Occasionally, the frenum attaches quite close to the gum line. Because of this close attachment and the resulting tension placed on the gum line, an increase in gum loss is often seen. The more gum that is lost, the poorer the long term chances of keeping this tooth healthy and feeling fine. When a frenum attachment is high on the gum line, a procedure called a frenectomy can be completed to release the tension on the gum line. This, in turn, allows for greater stability of the gum line, leading to a better overall prognosis for the area. This procedure often needs to be combined with a type of soft tissue grafting in order to adequately treat the area. 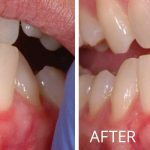 A frenectomy is a relatively quick and easy procedure to undergo as the patient. Once the necessary area is numb, Dr. Recker will release the frenum from it’s attachment near the gum line. He will disconnect the fibers that are attaching the frenum to the underlying bone and secure the frenum in a position away from the gum line. The recovery period for this procedure is typically quite short, with minimal to no pain medications needed and the ability to resume normal daily activities within 1-2 days. Do you show too much gum tissue when you smile? root surfaces or long teeth in your mouth? If you answered “Yes!” to any of these questions, Esthetic Periodontal Procedures may be right for you. 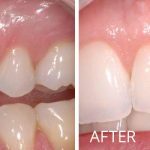 If one of the above issues is a problem for you, an esthetic crown lengthening procedure may be the best procedure to help you achieve the smile you desire. The procedure begins with sedation (oral or intravenous), if desired, followed by administration of a local anesthetic (Novocaine). Dr. Recker then optimizes the contours of your gum line before gently separating the gum tissue away from the tooth and underlying bone. Once any necessary adjustments have been made to the bone, the gum tissue is repositioned in the ideal location and secured. The esthetic results are immediate with this procedure and discomfort is described as little to none, requiring pain relieving medication for only a short time, if at all. 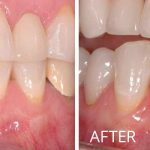 If you have concerns about darkened areas along the gum line, a gum grafting procedure may be right for you. 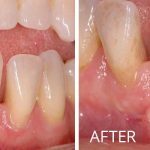 With a gum grafting procedure, the unsightly root surface can often be covered with new gum tissue that is indistinguishable from the neighboring areas. With this procedure, Dr. Recker begins with sedation (oral or intravenous), if desired, followed by administration of a local anesthetic (Novocaine). The exposed root surface is thoroughly cleaned, removing any bacteria and their toxins from the site. The gum tissue in the area is then prepared to receive the gum graft. The gum graft can be obtained either from the roof of the patient’s mouth or from a donor source. The choice of material depends on your presenting clinical situation, as well as your desires. Once this material is obtained, it is placed and secured at the treatment site, resulting in an immediate esthetic improvement. Although slight pain and swelling are not uncommon with this procedure, the use of prescribed medications, in conjunction with mild activity, will help to minimize these symptoms. Occasionally, a tooth is fractured deep under the gum or decay occurs under an existing filling or crown, to the extent where a dentist has a hard time placing a sound filling or crown on a tooth. 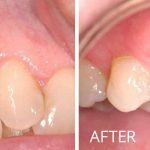 In these instances, a procedure called crown lengthening may be necessary in order to help your dentist place a more predictable, easier to clean, long-lasting dental restoration. With crown lengthening, the gum tissue will be moved or removed to allow your dentist access for proper restorative care. With this procedure, Dr. Recker begins with sedation (oral or intravenous), if desired, followed by administration of a local anesthetic (Novocaine). The gum tissue is then gently separated from the tooth and underlying bone, exposing the deep decay or fracture line on the tooth. Small amounts of bone are then removed from around the tooth, followed by a repositioning of the gum tissue. The gum tissue is then secured in place. 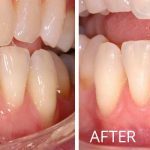 After 4-8 weeks of healing, the final restoration can be placed on the treated tooth. Are you currently missing a tooth? Do you have a removable appliance that moves around in your mouth? 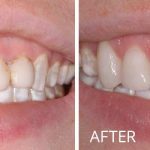 Would you like a new, strong set of teeth that are secure and do not need to be removed? If you answered “Yes!” to any of these questions, dental implants may be a solution for you to improve your life. Dental implants are artificial roots, placed under the gum, that are designed to either replace a missing tooth (teeth) or to secure a removable partial or complete denture. They are a great option for those individuals that have lost one or more teeth and desire a secure, long-lasting replacement. Dental implants are typically made out of titanium, which is an extremely biocompatible product that your body will tolerate well. No drilling or modification to the neighboring teeth is required. This helps to limit the potential for future cavities and nerve damage to these other teeth. Because dental implants are made of titanium, there is no potential for cavity development. A dental implant is a more complete tooth replacement, as it replaces both the tooth root and the crown of the tooth. Replacing the tooth root will allow for bone preservation in the area. Secure fit of a removable appliance. This will help the patient regain confidence in smiling and eating as the concern with appliance movement will be decreased. Bone maintenance. When teeth are no longer in the mouth, the bone that was securing these teeth is lost. This bone loss is accelerated when a removable appliance is in place. The presence of dental implants can help maintain your bone, thus helping to support the denture and also your facial structure. Regain the ability to eat virtually all foods. As the denture will be more secure, the ability to bite and chew foods will be improved. As complete chewing of foods is necessary for proper processing of foods and extraction or nutrients, a secure fitting appliance will help a patient maintain better nutrition and will help lead to fewer digestive problems. If there is a desire to eliminate the denture completely, dental implants can be used to provide a tooth replacement option that is fixed in the mouth. This can replace a whole set of upper and/or lower teeth, negating the need for the removable appliance altogether. When a tooth is removed from the mouth, the supporting bone starts to break down. If an implant is the accepted next step in the treatment plan, then a procedure called socket preservation can be performed at the time the tooth is removed. This will maintain the supporting bone structure until the implant is placed. Going without a tooth or implant for a long period of time can result in a substantial loss of the supporting bone. Occasionally, bone loss is such that there is not enough bone into which a dental implant can be successfully placed. In these situations, additional procedures (bone grafting) may be required to regenerate sufficient bone structure into which a dental implant could then be placed. This procedure is intended to prevent the loss of bone that often accompanies the removal of a tooth. By preventing this loss of bone, dental implant treatment becomes much simpler and more predictable. This procedure is completed at the same time the tooth is removed. The tooth is gently removed, preserving all the bone that is currently present. Bone graft material, generally donor bone, is then placed into the area previously occupied by the tooth. After a period of healing, typically 4-6 months, a dental implant(s) can then be placed. This procedure is necessary when there is inadequate bone present into which a dental implant can be placed. With this procedure, bone graft material, generally donor bone, is added to the deficient area. After a period of healing, often six months, a dental implant(s) can be placed. This procedure is often required when dental implants are replacing upper back teeth. In this area of the mouth, the maxillary sinuses have a tendency to grow down toward the mouth, into the space where the upper back teeth were once housed. This leaves an insufficient volume of bone into which a dental implant(s) can be placed. With the sinus augmentation procedure, a bone graft material, generally donor bone, is placed into the sinus to help regenerate the bone that once supported the teeth. After a period of healing, generally 6-9 months, a dental implant(s) can then be placed. The Advanced Periodotics & Implants team understands that some people can experience apprehension or anxiety when at the dentist. We do all that we can to make our patients as comfortable as possible during their procedures. In order to accomplish this goal, we offer relaxing medications for use before and during the procedures. You, the patient, will have maximum input regarding your experience during a procedure. Some people choose to have only local anesthesia (Novocaine) and be fully aware during surgery. Many people, however, feel uncomfortable with this and prefer Nitrous Oxide, Oral, or IV sedation as to be less aware or not aware of the activities of surgical procedures. Dr. Recker can help you choose the option that will make your experience as comfortable as possible. Please review our different sedation options available below to determine which best would accommodate your needs. Nitrous Oxide is a wonderful option for some patients. This is also known as “laughing gas”. This medication is administered through a mask in combination with oxygen. Nitrous Oxide helps to relax you, make time pass, and can help minimize discomfort. This option, in combination with local anesthesia, will allow you to be comfortable for your procedure. You are also able to drive yourself to and from your appointment with this sedation option, which is an advantage over the other forms of stronger sedation. Oral sedation is a great option as well for patients. Our oral sedation is a combination of oral pills that help relieve anxiety and assists you to rest during the procedure. The oral medication is given in the office, one hour prior to the start of the procedure. This allows the medicine time to take effect prior to beginning the procedure. This often leaves the patient in a much more relaxed state, although typically still aware of the activity around them. With this option, you will need a driver to pick you up from your appointment, as the medication stays in your system for 24 hours. The IV form of medication is a stronger form of sedation. For this form of sedation, there is no need to arrive early. Upon being seated in the dental chair, Dr. Recker will start an IV, typically in your hand or arm. The effects of the sedation medication will be felt almost immediately. Most patients fall asleep and stay asleep through the entire procedure and have minimal to no recollection of the procedure as the medication wears off. While you are sedated, you will be continuously monitored by Dr. Recker and his team to ensure the highest level of comfort and safety. As with the oral form of sedation, you will need to have someone available to drive you home from the procedure. You can also expect to feel a little sleepy for a few hours after arriving home.